This story was originally featured in ColoradoBiz. Click to read the full feature. In this ongoing series, ColoradoBiz magazine sits down with a Best for Colorado company to learn all about the impact they have in our state. In this Q&A, they spoke to Megan Jorgensen, Sustainability Director at Snooze an A.M. Eatery. Best for Colorado: Tell about your company. Who are you and what does your organization do? How long has Snooze an A.M. Eatery been around and what differentiates you in the marketplace? Snooze an A.M. Eatery: We opened our doors in the Ballpark neighborhood of Denver in 2006, and now have over 30 restaurants in four states. Snooze is a breakfast and lunch restaurant focused on serving delicious food with a fun twist. We work hard to serve responsibly-sourced ingredients from purveyors we believe in. We contribute to the communities in which we live and minimize our impact on the environment through waste reduction and resource conservation – thinking about the effects on our global community. We believe in the power of each individual to make a difference every day. We call it “breakfast, but different.” Every time a guest dines with us, their dollars go directly back to their communities and the waste produced for their experience is diverted from landfills. The food on their plate is responsibly sourced and the people who deliver their meal are happily taken care of. That’s a vast difference than how many restaurants do business. BC: Talk about how corporate social responsibility is a function or priority within your organization. How did that emerge – was there a specific event or individual that inspired this action? Is it a separate function from the core business or is it built into the fabric of the operations, product, service and team? SE: Snooze’s motto is “it only takes a moment to make a difference”. This is true with hospitality to our guests, the fact that we treat our employees like people, charitable interactions with our communities and our impact on the environment. Corporate Social Responsibility (CSR) functions have always been at the heart of our business. Our founders, Jon and Adam Schlegel, believed that business should focus on business to be successful – but that it also must focus on being a force for good along the way. There hasn’t been much of a separation since they started the company. 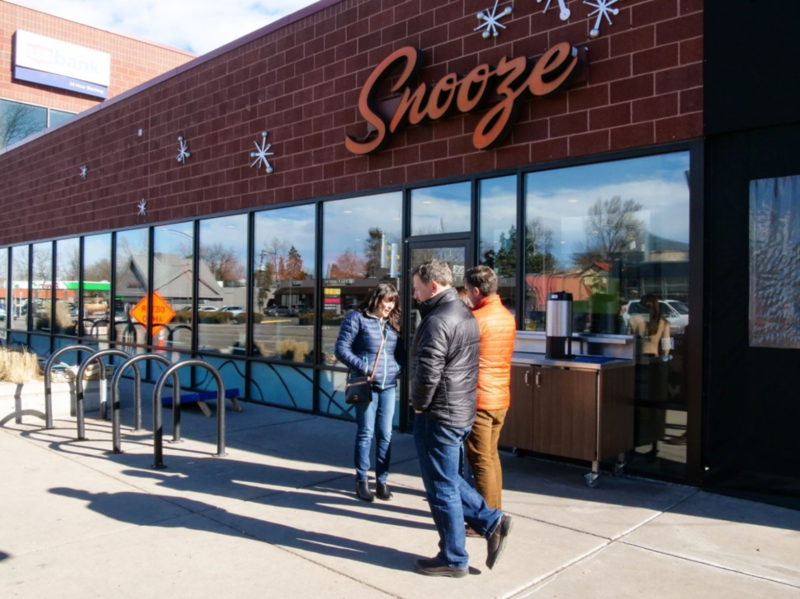 Snooze first opened its doors with a community giving partnership and single-stream recycling services and has added programs and practices along the way to continue to create more positive impacts throughout its operations. We have a people, planet, profit and pancakes mentality with our decision-making processes – ensuring that Snooze considers its impact on each area when deciding which retail shirt to purchase, which eggs and bacon to serve, what kind of disposable products to use and even which community partners we should support. This quadruple bottom line mindset is instilled throughout the entire organization and is woven through the fabric of this company. SE: Our Community and Sustainability programs are always evolving. We’re very proud of our accomplishments to this date but we still have a lot more work to do in our efforts to make this world a better place to live for future generations. In terms of sustainability, our main focuses are: The responsible sourcing and use of food and materials; an interactive, intensive waste management program; energy, water, resource and carbon conservation; and employee and community engagement and education programs. With our community program, we give 1 percent of our sales back to our communities through in-kind donations and services. We provide paid volunteer days for managers and employees. Whenever we open a new restaurant, we partner with three different community organizations to ensure we open our doors by first giving back, and we foster a culture of volunteering, giving back and sharing with those around us within each restaurant. We’ve come a long way since we first opened our doors in 2006 and continue to strive to be better. We’ve been working toward 2020 goals since 2013 and are currently establishing our 2025 goals. SE: It is always challenging to be on the leading edge of certain aspects of your industry. We are often the first company of our size or operational style to try new energy management programs, new waste or energy saving equipment, or even certain responsibly sourced ingredients or material goods. This can be challenging because we may find ourselves helping others work out the kinks that come naturally to trying something new. It can also be challenging to teach our managers that in addition to running their busy restaurants and ensuring guest satisfaction – they must also focus on sustainability and community efforts. Many managers aren’t used to this if they’ve come with experience from other restaurants. The rewards that come from this work far outweigh the challenges. We get to be on the leading edge of something great – business working as a force for good. We get to experience the delight in a new Snoozer’s (employee’s) face when they learn about all the extra things we do as a business and the positive impacts they get to be a part of. We get to hear the excitement from our partner purveyors when we ask them about the social and environmental programs they’ve instilled in their company, and that we consider their practices in our purchasing decisions. BC: Talk about how you were connected to the Best for Colorado program? Why is this umbrella organization and recognition program important for your organization’s CSR efforts? SE: Snooze was approached by the Best for Colorado program when it was in its early stages to be involved with the launch of the program. As the B Lab team explained the idea, we knew it was a no brainer to be involved in this crucial campaign dedicated to helping businesses build a more responsible economy for Colorado and the world. Snooze actively supports this program because it is easier for us, and all other companies, to make more positive impacts with our business when there are other like-minded organizations in our communities trying to do the same. Think availability and feasibility of waste hauling services, responsible food and materials and even access to reliable public transportation. This framework encourages us to continue to work toward a better future, not only with the actions within our own organization but the ripple effect that can be created from our work. We all still have a lot of work to do – continuously measuring how we are doing and comparing to others in our communities helps with prioritizing, collaborating, and accomplishing goals to make a difference! Being recognized as an Honoree for the Best for Colorado program is an incredible accomplishment for Snooze. We share this honor with other Colorado companies leading the way with positive impacts they can make on their surrounding communities. I truly believe the world will be a better place when all companies use this framework to measure and improve their impacts. Wouldn’t it be wonderful if all companies were striving to be the best for their people, the best for our communities, the best for the environment AND the best for the economy? It is certainly the world I would like to pass on to my son and future generations to enjoy.